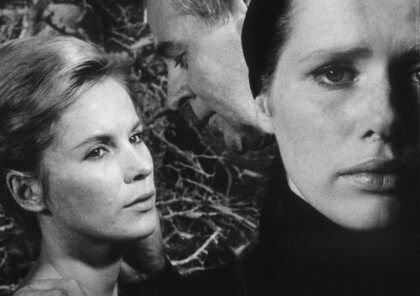 Bibi Andersson, the Swedish actress who starred in 13 Ingmar Bergman films, including Persona, died Sunday in Stockholm. She was 83. My favorite Bergman film is Persona, not least due to Andersson’s luminous performance, and one of half a dozen movies that had motivated me to become a film critic and film scholar. To this day, it remains for me the most complex, difficult, disturbing, and contradictory film I have seen or written about. Director Christina Olofson confirmed her death, noting that Andersson had suffered a stroke in 2009 and had been hospitalized. Andersson made a name herself after her complex role in Persona, in 1966, for which she received the award for best actress at the Guldbagge Awards, the Swedish equivalent of the Oscar Awards. Andersson began acting in her teens and had a wide-ranging career in film, television and on stage but was best known for her work with Bergman. He discovered her while directing a commercial for Bris soap in 1951 and cast her four years later in Smiles of a Summer Night. She would appear in 13 of his movies from the 1950s through the 1980s. Initially, Bergman cast the luminous actress as the stereotypical blonde beauty, representing girlish innocence and purity. The sun literally shone whenever she appeared onscreen as the wife and mother in The Seventh Seal (1957). In Wild Strawberries (1957), Andersson was cast as a blonde-haired maiden collecting berries in the forest. Bergman, however, obviously saw more in her. In the same film, he also cast her as a pipe-smoking, sharp-tongued hitchhiker with a short-crop haircut. Andersson gained international recognition, in her breakout role playing nurse Alma in Bergman’s Persona in 1966. Her intense performance, alongside Liv Ullmann’s psychiatric patient Elisabet, earned Andersson her first of four Guldbagge Awards — Sweden’s equivalent of the Oscar — and got her noticed in Hollywood. She appeared alongside James Garner and Sidney Poitier in the Western Duel at Diablo (1966) as a woman abducted by Apaches who, once rescued, wants to return. She played a soft-spoken psychiatrist tending to Kathleen Quinlan’s teen schizophrenic in 1977’s I Never Promised You a Rose Garden and Steve McQueen’s wife in An Enemy of the People (1978), which Arthur Miller adapted from Henrik Ibsen’s original play. Andersson also appeared in John Huston’s The Kremlin Letter (1970) and Robert Altman’s Quintet (1979). She played Richard Chamberlain’s mother (although a year younger than Chamberlain) in Wallenberg: A Hero’s Story, the 1985 miniseries about the Swedish diplomat who saved thousands of Jews from the Nazis. But it was in Europe that Andersson spent the bulk of her career and where she was most honored for her work. She won best actress honors at the Cannes Film Festival in 1958 for Brink of Life — sharing the honor with her three female co-stars — and best actress honors at the Berlin Film Festival in 1963 for The Mistress. In the U.S., her two National Society of Film Critics awards did, however, come for Bergmann films: best actress for Personal and best supporting actress for Scenes From a Marriage (1974). In the latter movie, playing, with Jan Malmsjo, a bickering married couple, Andersson demonstrated how far she’d traveled from the role of a “professional innocent,” as she once described, in an interview, her early professional persona. Andersson appeared in European TV roles, including the medieval adventure drama Arn, made as a miniseries, in 2010. Her stage career included three decades of work with Stockholm’s Royal Dramatic Theatre, starring in classics by Shakespeare, Moliere and Chekhov. Andersson made two Broadway appearances: Full Circle in 1973 and, together with her frequent film co-star Max von Sydow, The Night of the Tribades in 1978. I was fortunate t see the latter while I was a film student at Columbia University. Andersson also worked as a theater director in Sweden, staging several plays. During the civil war in Yugoslavia, she worked with several initiatives to bring theater and other forms of culture to the war-battered region.